Trying out Work Barshared work space today. I actually got quite a lot done (Facebook on the screen to protect the innocent). Thanks Nate James Bae Kupel! We shot some video of the protests on Boston Common for ARD, a major German news network, did some interviews fed them, and then did a live shot. My office du jour. Shooting Peer View Talks with Mark Helton at Red Sky Studios. Had a great time shooting for Bloomberg TV at MindTrek VR's new virtual reality arena, located outside Boston. My office du jour. Shooting outdoor interviews all day for Amica Insurance. Watching my work on the Jumbotron on the Esplanade. Bloomberg TV is sponsoring and televising the Boston 4th of July fireworks for the next three years. 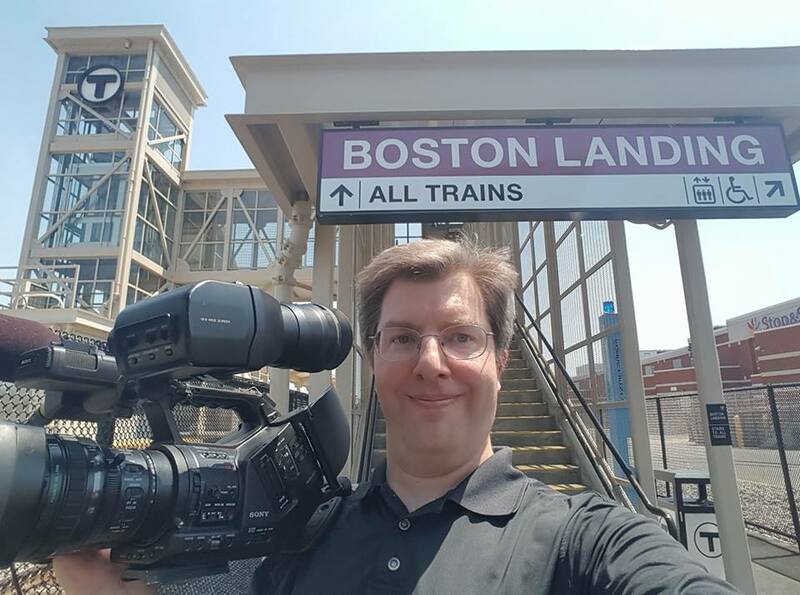 I shot some of the 3 minute "Love Letters to Boston" segments that are showing on the big screens tonight while the rest of the world is watching commercials. They will be televised worldwide, and available on the web later as well. Today's office du jour. Shooting green screen with David Pryke, John Mahoney, and Chuck U. Rosina for Sanofi for the next few days with Award Productions. The opening of the new Boston Landing T stop in Brighton Massachusetts, next to WGBH, the new New Balance HQ, the new practice arena for the Bruins, etc. Shooting at a Nielsen (yes, the people who do TV ratings) lab. So much for staying warm at home and watching reruns! I did live shots for NBC News Channel in the blizzard from wonderful Worcester, Massachusetts for two days. I attended Alister Chapman's cinematography workshop at Rule Boston Camera today to learn about his philosophy and techniques for exposure with Sony cameras like the F5 / 55, FS-7, and FS-5.